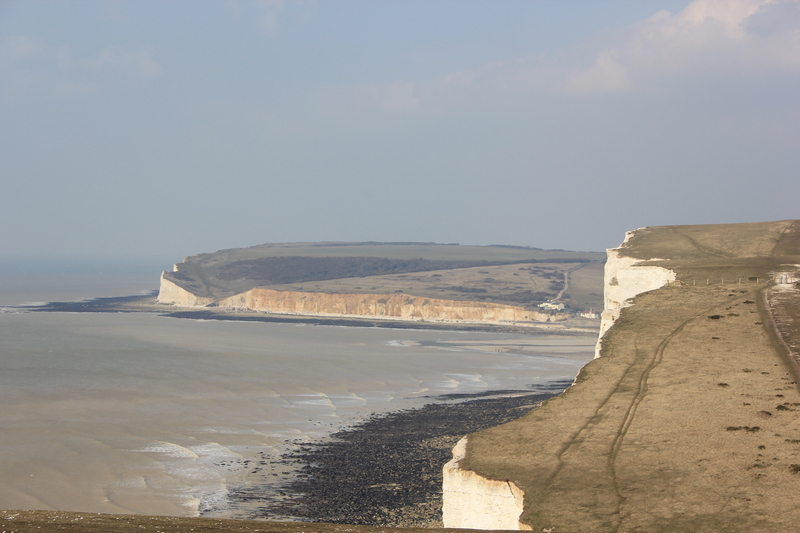 The Seven Sisters are a series of cliffs of about 2 miles in length. In terms of their span, they are small. In terms of the full coastline of Britain, which is what we intend to walk, they amount to less than 0.0003%. In terms of their impact, however, they are absolutely enormous. 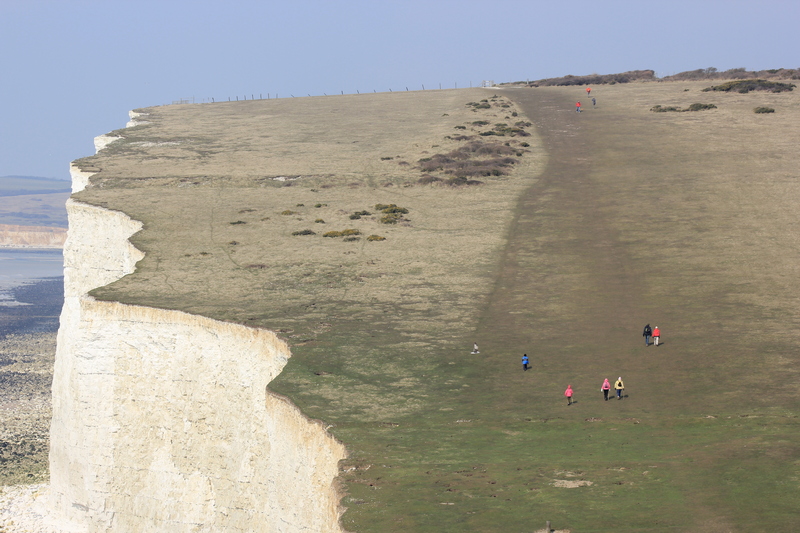 The Seven Sisters is one of the walks that we will remember. The cliffs here took millions of years to form. But when you realise exactly how the chalk is formed, the scale of what has gone on really hits home. Chalk is formed from lime mud. The lime mud is formed from microscopic skeletons of plankton. Millions, upon billions, upon trillions of plankton died, settled on the seabed, and over time became the chalk cliffs that exist today. Looking back into the haze of the east, the cliffs receded in various shades of grey. Belle Tout Lighthouse stood proud, and behind it we could see Beachy Head in the far distance. Looking ahead, we could see the cliffs of Hope Gap which, like the Seven Sisters themselves, is a valley which had been carved out of the chalk during the last ice age. There are pieces of chalk which are littered all over the cliffs. 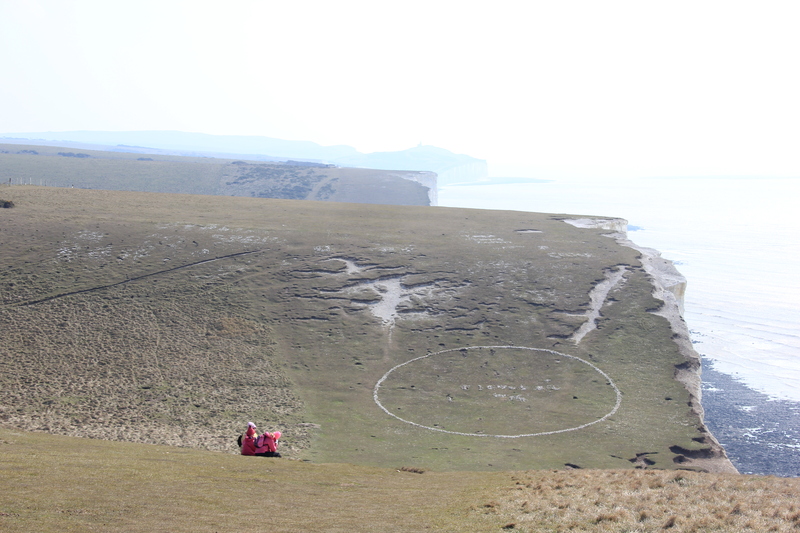 At Short Brow, someone had used these pieces of chalk to form an enormous, yet perfect, circle. When walkers pass cairns on mountainsides, they pick up a stone and put it on top, thereby maintaining the cairn for the benefit of future walkers. 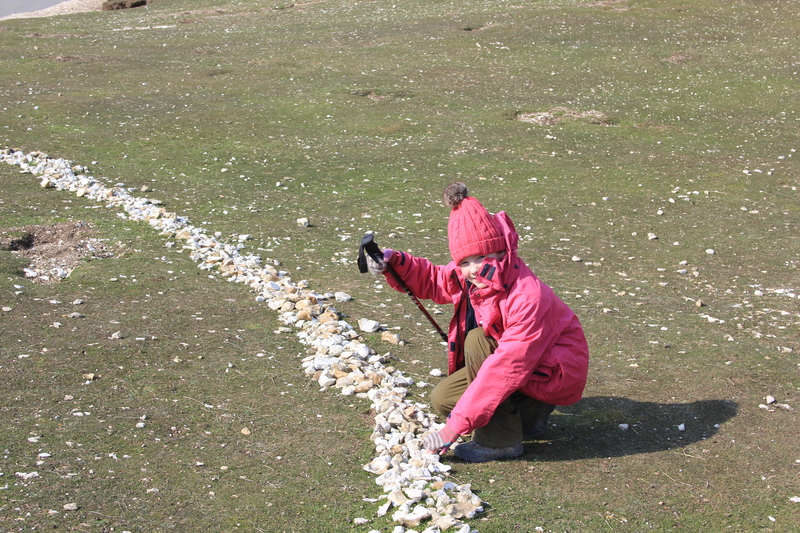 We did the same here, putting some chalk pieces into the line of the circle. You can’t see the chalk circle on Google Earth, at least not as I look at Google Earth today. 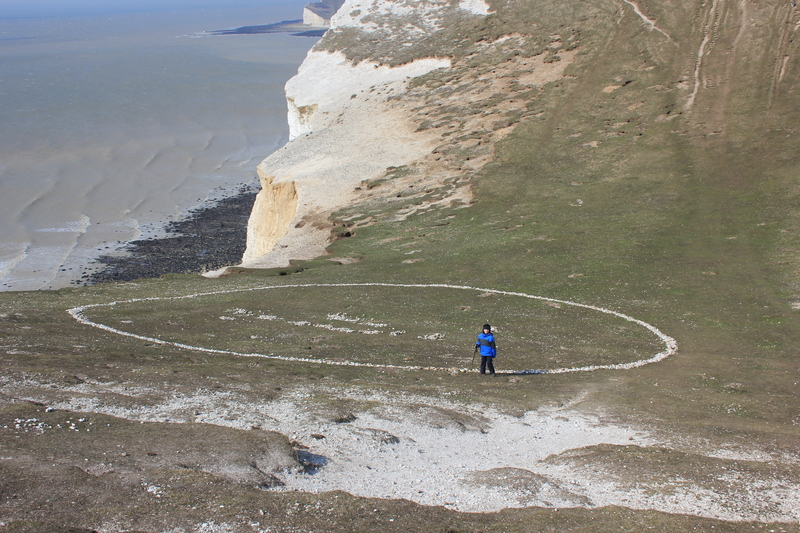 Perhaps, if enough people keep putting small pieces of chalk back into position, the circle may last long enough for it to be captured for the next satellite photograph. Perhaps, sometime in the future, when you paste the co-ordinates below into Google Earth, you might see it. 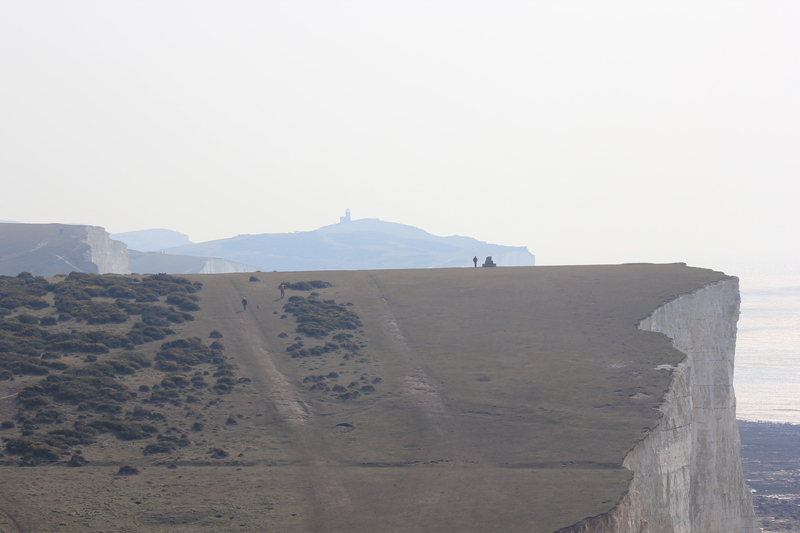 This entry was posted in East Sussex and tagged chalk, cliffs, coast, East Sussex, seven sisters, travel, walking. Bookmark the permalink. This region of England is absolutely magical. Lovely photos! This is so pretty – I want to go there!